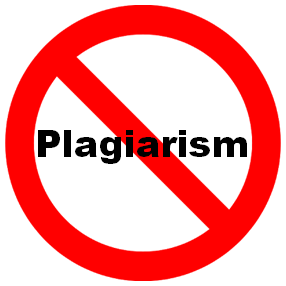 OWL Purdue Plagiarism: Is It Plagiarism Yet? 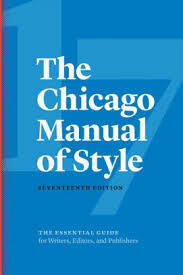 In Chicago Style, there are two (2) types of formatting choices. The Notes and Bibliography style, which utilizes footnotes and endnotes both for citing material and also to provide extra information should the author wish to, and the Author-Date style. The author(s)'s name(s) will be listed as firstname lastname, rather than lastname, firstname like it is in the Bibliography. The publication information will be in parentheses. There will be a comma after the publication information, with page numbers citing either your quote or the pages in which you found the information you're using. 1. Barry Estabrook. Pig Tales: An Omnivore's Quest for Sustainable Meat. (New York: W.W. Norton & Company, 2015), 15-25. 1. Estabrook, Pig Tales, 15-25. In-text citations can also be used to tell your professor which source you used at a specific point in the paper. These citations also correspond to the full citation found in the Reference List at the end of your paper. Use a signal phrase and a quote. A signal phrase introduces the author in a lead in a sentence with a quote, and then places the publication year and page number at the end. Pollan explains that "the apple, like the settlers themselves, had to forsake its former domestic life and return to the wild before it could be reborn as an American" (2001,13). Use a direct quote. A direct quote places the author, publication year and page number in parenthesis at the end. "In effect, the apple like the settlers themselves, had to forsake its former domestic life and return to the wild before it could be reborn as an American" (Pollan, 2001, 13). Use a signal phrase and a paraphrase. A signal phrase introduces the author in the sentence, and rather than quote the author directly, you restate the author's ideas in your own words. This is followed by the publication year and page number in parenthesis. Michael Pollan compares the apple to the settler, because both required an experience in the wild in order to fully express the American experience (2001, 13). The reference list includes full citations all sources used in your paper. This should be organized alphabetically according to author last name. If your source has no author, use the first letter of the title. For the Notes and Bibliography style, this list of references will be called "Bibliography." If you are using the Author Date style, title your list "References" or "Works Cited." Note the difference in the following two examples of where the date is placed. Estabrook, Barry. Pig Tales: An Omnivore's Quest for Sustainable Meat. New York: W.W. Norton & Company, 2015. Pollan, Michael. The Botany of Desire. New York: Random House, 2001. Estabrook, Barry. 2015. Pig Tales: An Omnivore's Quest for Sustainable Meat. New York: W.W. Norton & Company. Pollan, Michael. 2001. The Botony of Desire. New York: Random House. 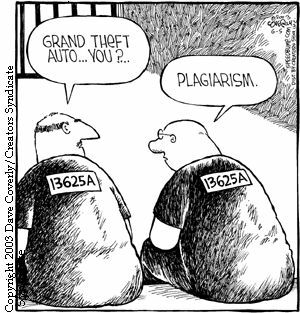 There are many different types of plagiarism, including self-plagiarism. You should cite a source if you reproduce, quote, paraphrase, or summarize ideas and/or media created by other individuals. 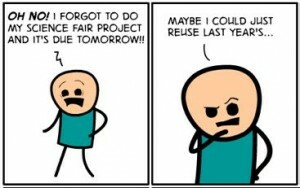 When in doubt, cite!